I discussed this game very briefly once, but, it was unfortunately mentioned in passing. To be honest, I love this incredible mod. I was thrilled to chat with the creator, Davey Wreden, at the event, though I fear I put my foot in my mouth a little, because, what I love about the thing is the way it sort of parodies branching narrative, but, really… it’s not just about that, is it? It’s hard to explain. But, it’s free, so you should just check it out if you have the chance. You’re going to want headphones or some way to hear the sound clearly, since the narration is what really carries it. If you happen to enjoy it, the HD Edition has also been Greenlit for future Steam release. I’m looking forward to it. A game I’ve discussed before in more depth, during my 2012 roundup. I was happy to get a chance to see an annotated playthrough at the con. Short but worthwhile. A fantastic game. But with some accessibility problems that I fear cripple its chances of receiving a broader audience. You may have seen my roundabout full review. Like many people, I first played Cart Life based on Joel’s recommendation at Electron Dance. Like, I am sure, many people, I wasn’t sure I liked it at first. But it’s a game that eats away at you. 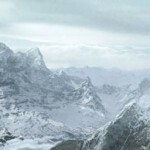 It’s a game that almost dared me to return. Cart Life is a bleak game, but it’s not, explicitly, about sadness, in the way of say a Depression Quest. 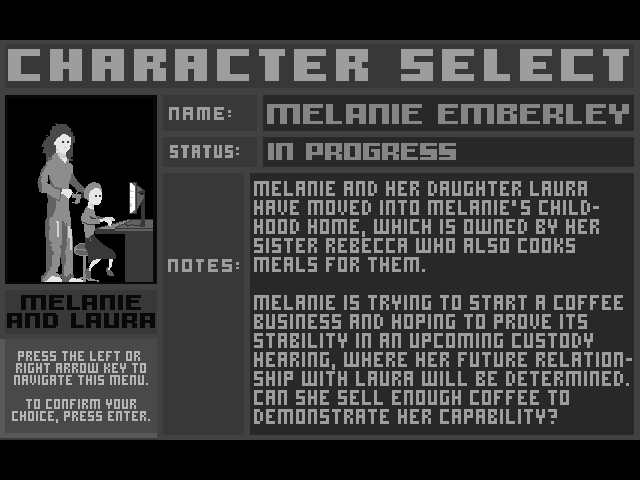 It’s just a game about regular people in an often-cruel world, giving it the best they’ve got. It’s become an experience I find myself recommending to people over and over again. And it was great to be able to meet Richard Hofmeier and discuss … well, things in general, as he’s a pretty insightful person. I also attended the panel on Games as Commentary to learn a little more about, well, whether or not the game is commentary. It maybe isn’t. Cipher Prime’s Splice, a game I’ve covered before, was an official IndieCade selection. But they also had another game on display: Intake, which they’re currently playtesting. Intake is a kind of Dr. Mario-meets-Ikaruga, with dubstep. It’s a lot more frantic than Splice is, but with the same jewel-toned aesthetics. It’s one to watch out for. While some party games make me concerned for their accessibility for audiences, I have no such concerns about Bloop. Bloop is a dead-simple, “wish-I’d-thought-of-it” game for the iPad. Each player, of up to four, is assigned a color. The players tap their color on the screen, whenever that color appears. That’s it. But the game itself occurs somewhere above the iPad, where players constantly slap at each other’s hands, tangle their fingers, and attempt to occlude the screen for others to get a victory. While I didn’t actually play Rakete, it makes a pretty fantastic spectator sport. This game resembles Lunar Lander. There is a sort of wobbly ship, and the object of the game is to traverse it through space, and then land it, upright, without crashing. 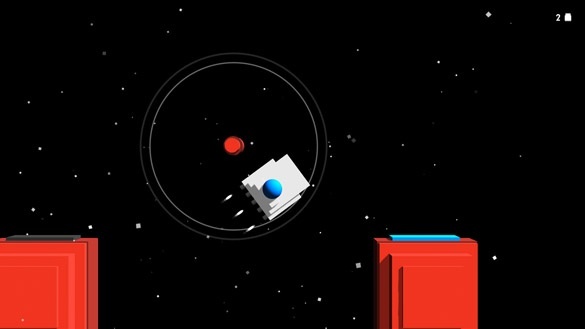 The catch is that the ship has five retro-rockets to propel it, and, in the ideal form of the game, each rocket is driven by one player with a single button. Can five people coordinate as a team to drive one ship? That is the hook. I would say I was on the edge of my seat, but I was standing. So that’s what I checked out at IndieCade. Stick with me later this month, where I’ll most likely be playing some games at PAX East, and writing about those, too! 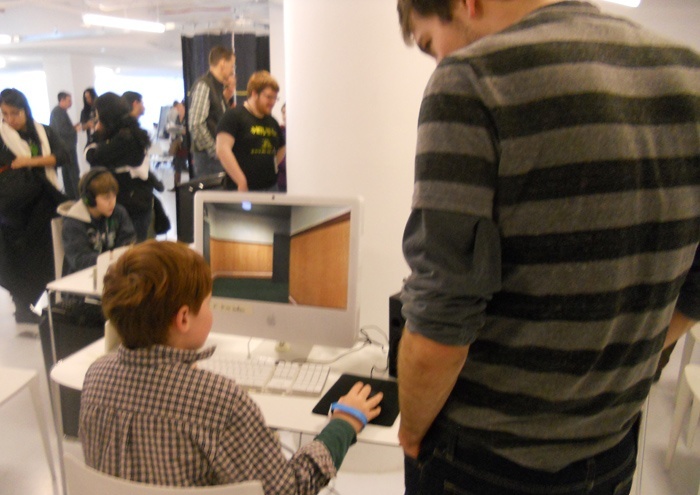 I’ll leave you here with my best photo: a bright kid who was really enjoying discussing The Stanley Parable. This kid gets it. Nice list, Amanda. I didn’t realise you’d actually played Cart Life, can’t remember if you’d mentioned it before. I did! And at first, I was like: wow, why would I ever want to play this? If I had originally written in response to your recommendation, I probably would have said, “hm, I don’t think I get it.” But like I said, the game really eats away. I kept wanting to give it another try. I keep starting Cart Life and not making much progress before getting distracted by something else. It seems like something that deserves more time than I’ve been able to give it, but I fully intend to devote the hours it requires sooner or later. Great list, Amanda. IndieCade is such an important event, inspiring the unique and unusual from all over the world. While stuff like PAX and E3 are important for the big guys, something modest like IndieCade is perfect for the experimental and out of the ordinary. I’ll keep my eye on Intake, too. I haven’t been enamored of Cipher Prime’s work since Auditorium, but I like that they do what they do. I don’t think Intake has enough variety to it yet, but it’s still in an early stage, hence the public testing. A pretty good indie games scene has been building up in Philly and even Harrisburg lately so it’s cool to be able to try new demos. 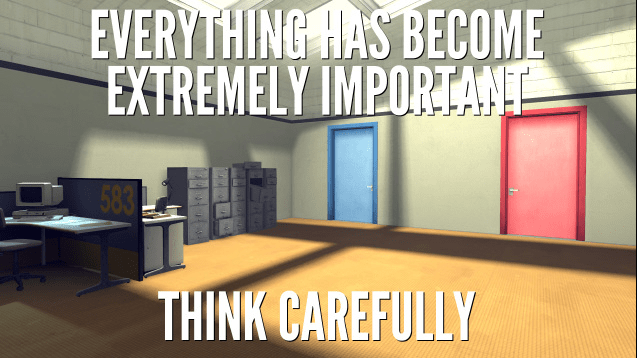 The Stanley Parable sounds really interesting, I’ll have to take a look at it. And I’ve still not played any of Chung’s games apart from Atom Zombie Smasher — I have no idea what Gravity Bone and Thirty Flights of Loving are about. Cart Life I’ve started several times and love the way the mechanics and dynamics push and jostle you around uncomfortably but I’ve hit several game-breaking bugs each time which have forced me to make undesirable decisions in-game to sidestep them or restart the game. A shame because I just managed to get my coffee stand up and running so its claws were in me. Rakete sounds like a brilliant idea and Bloop particularly. I seem to remember there was an indie game that involved different players operating different bodily functions for the protagonist: walking, jumping, eating, flatulating, breathing sufficiently… can’t remember for the life of me what it was called. NOoooo Gregg!! How can have not played Gravity Bone? The best ten minutes of your life! !